ADELANTE program participants will be prepared to teach English language learners with special needs. Prospective teachers will be trained in the use of curricula aligned with the new California Standards for English Language Development and Common Core Standards. Participants will receive instruction that accelerates the acquisition of literacy, academic language, and content knowledge. As part of our international experiences requirement in the Department of Special Education, participants will also have the opportunity to study at a Summer Institute in Avilla, Spain to continue to polish Spanish language skills and to engage in international comparisons of school experiences including special education. ADELANTE is a Bilingual/Special Education Dual Credentialing program to Enhance Language Acquisition and to promote Literacy. It is a "path maker" project proposed in response to the need for bilingual teachers. The ADELANTE Program is designed for bilingual individuals proficient in Spanish and English who will be prepared to teach English language learners with special needs. You will be trained in the use of curricula aligned with California Content Standards and instruction that accelerates the acquisition of literacy, academic language, and content knowledge. This is an intensive two-year program with the outcome of enabling you to attain a Bilingual Emphasis credential and a credential as Education Specialist in Mild/Moderate disabilities. ADELANTE is a partnership between school districts and two higher education departments at SDSU specializing in Bilingual and Special Education. Estimated based on available federal funds. *Admitted students are responsible for meeting special grant federal requirements and must agree to return the stipend should they default on the requirement to finish the programs according the ADELANTE contract. 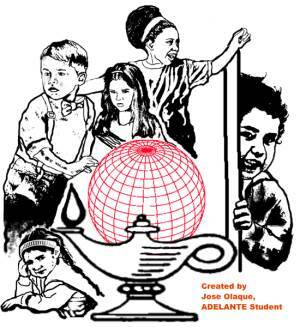 ADELANTE will fund the two year Program, a total of four semesters.